harried / By a red-winged blackbird. 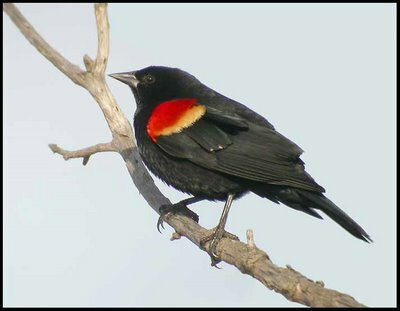 Well, if you really want to know, I'll tell you: my favorite bird might be the red-winged blackbird. It might also be the Canada goose (and early this afternoon a small flock skittered over town, sounding all disarray). But for now I'll tell you about blackbirds, before I go off to read and then to sleep. I saw red-winged blackbirds for the first time when I visited my OhioanIowanOhioan (she's moving back!) friend in Iowa two years ago. When we took our full-day mystery trip out to the Loess Hills and the Broken Kettle grasslands, we kept seeing these black birds, too small to be crows. I don't remember how we figured out what they were; perhaps my friend knew all along and simply filled me in, or perhaps we looked them up when we got home. They're not at all an uncommon bird; in fact, they're everywhere in this country. But somehow I'd never seen one. What I love about these birds is that they can seem fairly plain and then can suddenly dart a blast of color at your eye, flicking their red shoulders as they fly. I saw one on Monday. It flew across the highway, east to west, and what I saw first, fastest, brightest was the red at the wing's top. The bird was a black-bordered burst of color. I started seeing red-winged blackbirds this spring during my drives out into the countryside; the day my excellent friend and I drove, the same day I took all the drive-by pictures, I saw blackbirds everywhere. They don't come into town, not even into our little town. They are strictly country birds. They dip and alight; they sit on barbed wire fences and on power lines. On my way to pick up my moving truck on Sunday, I saw a hawk and a red-winged blackbird swerving and giving chase, dipping and fighting and darting. I thought of the lines in G.C. Waldrep's "Battery Alexander" from which I've taken my title tonight: "Above, a hawk harried / by a red-winged blackbird. / (Theirs is a private argument.)." Lots is happening for me at this moment of vision meeting memory meeting poetry; I tend not to keep many lines of poetry (and very many fewer full poems) at the tip of my mind. The ones I do keep quite often involve birds; someday, I'll recite Hopkins's "As kingfishers catch fire" for you (each mortal thing does one thing and the same, after all; I cannot help but selve, go myself: my self I speak and spell). But this image from my soon-arriving colleague's poem has stuck since March, and seeing the birds hashing out their private argument in flight activated it once again. I'm trailing. It's time to read and then to sleep. I'll tell you more blackbird stories later, perhaps. For now, read and listen up. 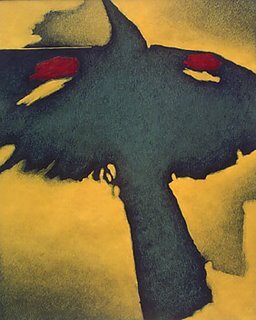 sources for tonight's images: 1) Robert Cox's "Redwing Blackbird #3" comes from Art in Context; 2) South Dakota Birds and Birding.